Over 80 shooters from BC, WA, CA, OR and NV attended the 3 day shoot at Smith River, CA for the famous Crab Buckle Shoot. 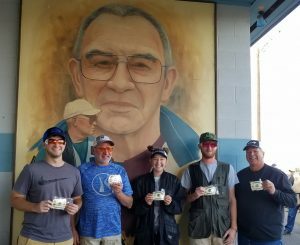 Some of the 1st timers attending were Bruce Mitzel (Tulelake, OR), Karen & Gary Hogue (Orovada, NV), Craig Wentworth (Merced, CA), Greg Deedon (Redding, CA), Chet Norcutt (Winnemucca, NV), Justin Evans (Elko, NV), Joe Stuart (Medford, OR), Glen Jager (Woodland, CA), Weldon Birch (Oakley, CA) and Tye Winegar (Madras, OR). Bud Hoffman finally secured a crab buckle after trying for 15 years. 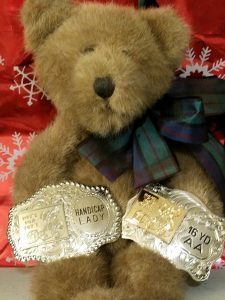 Others winning a buckle for the 1st time were Greg Deedon, Keary Taylor, Cole Costanti, Zeb Kitchen and Brad Eatmon. Weather was typical – sunny Friday, wind and rain Saturday and back to just pouring rain on Sunday. 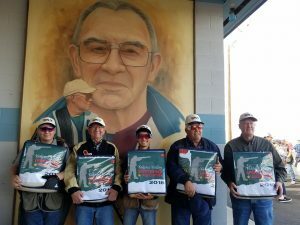 Hats off to Del Norte for a great job and to the trapshooters that toughed it out. Read the story published in the local paper and see more photos on our results page. Attention shooters, Effective January 1, 2019, Oregon State Trapshooting Association target fees will go up to 2 cents per target. All clubs should have received their new target forms by now. If you still need them, please contact Jennifer Carter or Mike Riggs. This target increase will directly benefit the Oregon State Shoot as our trophy budget has not been increased in over 15 years. This increase will also put our target fees in line with those of the other PITA states and provinces. If you have any questions, please feel free to contact any OSTA board member or Secretary, Jennifer Carter. 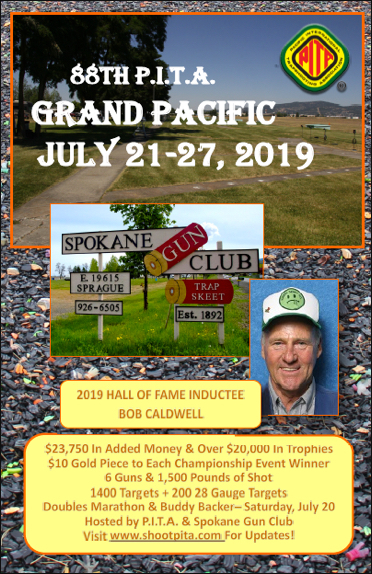 Wenatchee Gun Club will be hosting a PITA shoot June 14-16, 2019. Friday the 14th is the Washington Doubles League (500 doubles) with a regular shoot following on the weekend. Be sure to add this to your calendar as it is not listed in the small yellow 2019 pocket schedule. For more information look at the CALENDAR page. The October 12-13 SVIR Fall Open shoot has been rescheduled for October 19-20, 2019. Please change your calendar. Congratulations to the 2018 PITA All Stars! PITA wishes to congratulation the members of the 2018 PITA All Star teams. Teams include eighteen first time All Stars along with a 47 time member (* denotes 1st time member). More information and photos can be found in the 2018 PITA Averages & History Book – click here to order. Order your 2018 Yearbook early and save! Order your 2018 PITA Yearbook before 12/31/18 and SAVE! After the book is shipped from the printer the cost of postage goes up so save a few bucks and order now. This 200+ page book contains results from 2018 along with photos and other fun facts. Click HERE to order. November Multiplex results are posted! Check the Shoot Results page to see the winners. 49/50 in handicap earned a 1/2 yard so be sure to note your new yardage if you shot a 49 – there are 4 of you! Congratulations to Pat Bare – HOA winner for November 145/150.